Has anyone else been driven to desperation by their kid? I’m talking about the kind of desperation where you end up feeling like you need to be in a dark silent room for at least an hour, in order to recover. The kind of desperation that is brought on by a tantrum of humongous proportions. If the tantrum were an earthquake it would be off the Richter scale. It does, in fact, feel like an earthquake! Your otherwise adorable offspring turns into the uncontrollable, screaming, insult hurling brat that you tend to see on ‘super nanny’. It lasts but for a moment, whether that’s literally a minute or thirty. When it’s over, they go back to being their lovely little selves. Anyone know what I’m talking about? Anyone else been there? I know the answer is yes! I’m pretty sure that every mum who’s ever had young children has, at some point, been in that situation. Often, when I discuss this kind of desperation with other parents who know my four year old daughter, they say: “Not Aliyah! I don’t believe it.” The reason they don’t believe it is that my daughter is usually a picture of politeness and propriety. Every morning on her way up the steps of Cameron House nursery school ( the BEST in Edinburgh by the way ;-)), she greets each child and parent or grandparent: “Good morning!” She makes polite conversation and shows a genuine and cheerful interest in people. You would think she’s been to four year old finishing school sometimes. She is, in fact, truly and gorgeously lovely, most of the time. So how could anyone imagine there’s another side to this sweet child? There are practical/ physical reasons why, like tiredness and hunger. These are usually quite easy to fix. Just carry a bag of dried apricots, some kind of carb snack, and a water bottle at all times. Make sure you stop to rest. Simple wisdom. I reckon kids have it tough these days. There are so many stimuli in their world. So much to take in: TV, computers, iPhones, iPads; Princesses dress apps, talking Tom, talking Pierre, talking Gina. There’s Peppa pig, princess Merida, Doc Mc Stuffins. And as if all that wasn’t enough, we ( me very much included) tend to want to educate and develop our kids with endless extra curricular activities: Swimming, ballet, gym nippers, kinder music. To add a bit more, we take them travelling. They experience new sights, new tastes, new smells, relatively often. It’s a great and exciting life they lead. But I’m just starting to wonder if it’s all a little too much. Because apart from all these stimuli, their little souls have so much emotional stuff to come to terms with: why little Johnny at nursery called them ‘stupid’; why little Miranda will talk to them one day and the next day ignore them; why sometimes they feel happy and sometimes sad. Horrendous tantrums might, just might partly be an expression of confusion and insecurity. Of not knowing what to do with it all? The conclusion I’m starting to get to, is that now, more than ever, kids desperately need very clear boundaries in their lives. Boundaries that tell them where they can go and where they can’t. Boundaries that let them know what they can and can’t do in order to be safe and confident in the midst of all the stimuli, the emotions, and the power struggle. These boundaries, for my kid and me, are about things like talking back, shouting, running off in the shopping centre, being kind, tidying up, being polite. They are about little things that can make or break your day. Little things that can hopefully navigate you away from that devastating, desperate earthquake of a tantrum I was describing earlier. Or at least navigate you away from having several in a day. Recently I’ve employed a new method in order to explain to my Aliyah about when she’s getting close to a boundary. A good friend of mine suggested this to me during a desperate mums’ conversation. Aliyah and I have agreed on a code. She and I know that when this code is signalled, it acts as a warning sign that a boundary is about to be crossed. 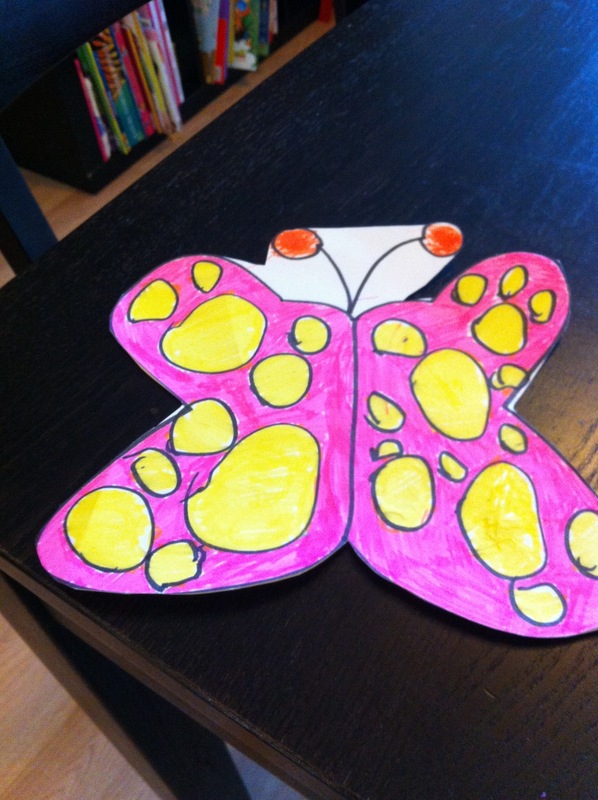 The code is “Pink and Yellow Butterfly”. We even have props that we’ve made together, to hold up. I guess they act a bit like stop signs. They are supposed to stop her in her tracks; to help her avoid “tantrum lane.” She knows that when I say the words and or hold up the sign she is about to go too far. If she choses to ignore it, there are consequences. Establishing boundaries is hard. And helping a little one to not cross them is even harder. It takes endless repetition and a good measure of emotional energy. My hope is that it helps get a little kid to feel more safe and happy. And that eventually, it helps to maintain some level of sanity in a mum’s crazy world. Easier said than done, you say? Absolutely agreed! So your comments, strategies and thoughts are most welcome!